The full touch terminal Memor 1 from Datalogic is the new multi-talent for all tasks in retail, logistics and transportation. It is available as a handheld version or with a pistol grip. The mobile terminal features a 4.3'' touch display and a 2D imager with Datalogic's patented »Green Spot« technology. 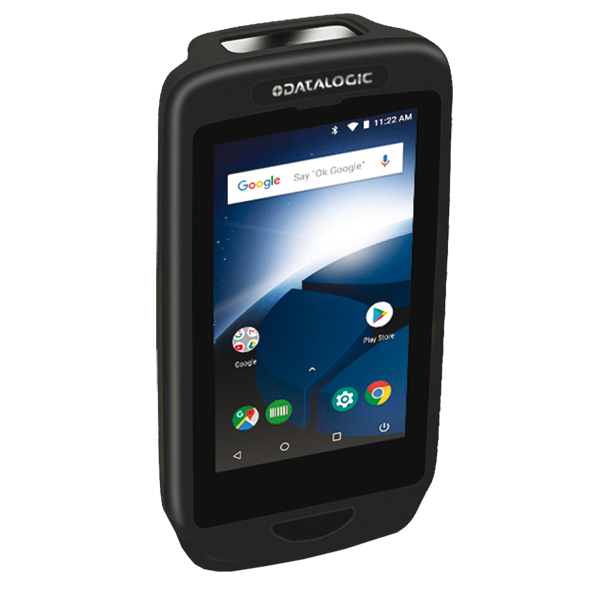 Datalogic has equipped the Memor 1 with the update-capable operating system Android 8.1 (Oreo) with Google Mobile Serivces (GMS). The Memor 1 may be quickly charged wirelessly. This is not only practical, but it also makes the terminal highly robust and reliable. You may also use the Memor 1 as a telephone or with the push-to-talk function with VoIP. It features Bluetooth and NFC and is WLAN-capable. Thanks to the platform »Datalogic Shield«, the Memor 1 is a sustainable investment for your customers. They will receive regular security updates for years to come, firmware and at least two complete system updates, plus one year of support beyond the life cycle of the Memor on top. Order the Memor 1 from Datalogic with your sales representative. Give us a call!